a. With the consent of the President of the University, the Student Conduct Committee may sub-delegate jurisdiction to handle violations of the Student Conduct Code to University officials, committees or alternative processes. In all instances such sub-delegation shall be defined by the Committee in terms of specific jurisdiction, enforceable regulations, and maximum disciplinary sanctions that may be imposed. The Board wants to consider changes to the Student Conduct code in March. Sandy Weintraub runs the meeting in the absence of a quorum to elect a chair. There are two Emerald reporters here. The wonderful “I hit it first” episode comes up as an example of how the exercise of free speech may inspire multiple charges from the Conduct Office. Link here. Discussion revolved around the possibility to use the appeals process to get peer representation. 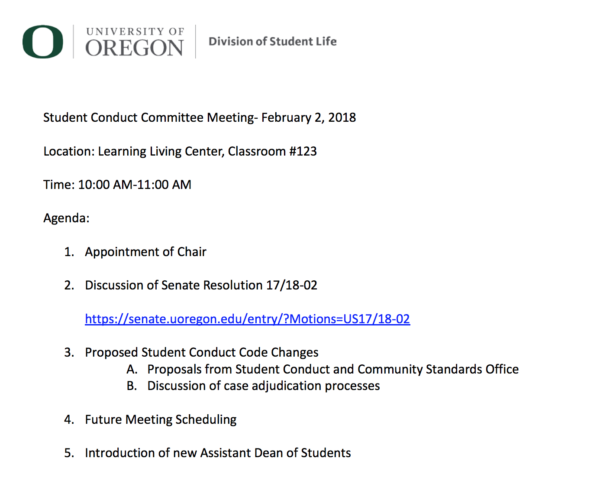 But there are very limited opportunities for appeal in the current code, which essentially gives the Student Conduct Code Administrator the power to reject a University Appeals Board decision. The Committee agreed to postpone additional discussion until the next meeting, with student members present. The committee will meet again Feb 16.